﻿ Real Madrid 4-1 Sevilla. Not hitting the brakes anytime soon! 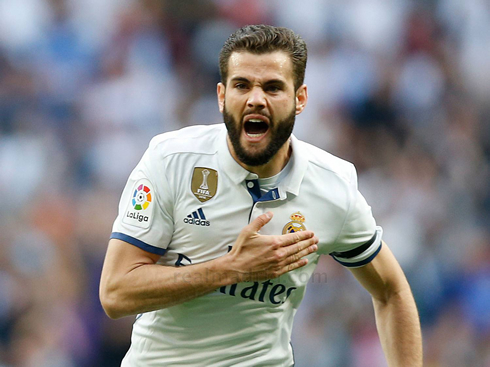 14.05.2017 » Real Madrid 4-1 Sevilla. Not hitting the brakes anytime soon! Real Madrid defeated Sevilla by 4-1 today at the Santiago Bernabéu and are now just 2 games away from crowning themselves the new Spanish champions. Nacho score the opener, Ronaldo scored a double and Kroos set the final score late in the second. 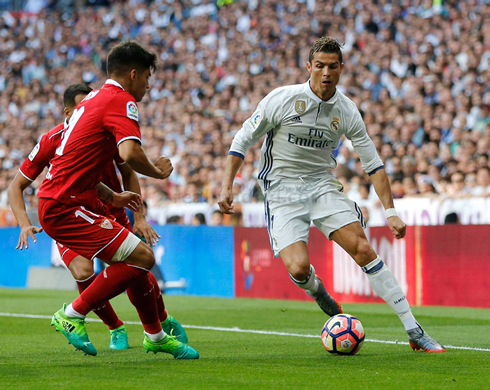 The Bernabéu hosted its last game of the season and Real Madrid didn't disappoint their fans in a 4-1 win over Sevilla. The 3 points earned today allow Zinedine Zidane's men to keep depending exclusively on their own results to become champions and everything will be at stake in Madrid's next 2 games away from home, the first against Celta de Vigo this Wednesday and the final fixture on Sunday against Malaga. Today, it was all about collecting the 3 points and the Merengues leaned on Nacho, Cristiano Ronaldo and Toni Kroos goals to go through another opponent. Three more finals left: 2 in La Liga and the UEFA Champions League final against Juventus! Sevilla was expected to be a massive test for Madrid and while the final score may indicate that it was a comfortable win, it certainly wasn't at time. But in the end, Real Madrid were able to prevail as they've done all season. 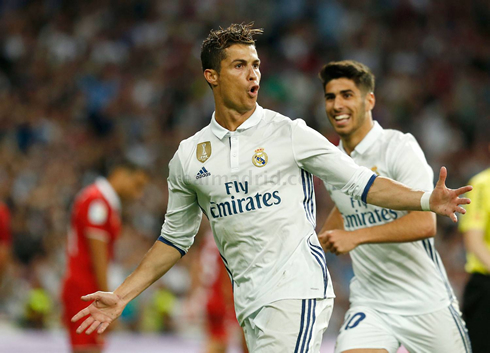 A double from Cristiano Ronaldo and a goal each from Nacho and Toni Kroos were enough to see off a plucky Sevilla team that certainly made it difficult at times for Los Merengues. Real Madrid started off extremely well. A quickly taken free-kick by Nacho gave them a 1-0 lead and soon after, Ronaldo was able to pounce on a rebound to make it 2-0. However and as time went on, Sevilla started to take control of the match and Madrid's comfort became their downfall. Keyword Navas, seemingly fighting off goals and David De Gea speculation at the same time, was fantastic making a series of clutch saves to keep the game in Real Madrid's favor. Unfortunately he couldn't stop Sebastian Jovetic's well-places shot early in the second half... That goal made it 2-1 and raised some legitimate concerns. Panic slowly began to set in amongst Madridistas. Sevilla continued to pile on the pressure, but were often thwarted by a poor final ball. Real Madrid were able to weather the storm and with a few changes were able to reclaim the match. Then came the moment of the match, by none other than Cristiano Ronaldo. Toni Kroos was played through in an unfamiliar position down the left side when, calm as ever, centered the ball to the left foot of Ronaldo. Despite Kroos' efforts, it was difficult to place the pass perfectly - but that didn't matter to Cristiano who pummeled a left footer into off the underside of the cross bar. It was a phenomenal goal, perhaps his best of the season. The third goal was just a well oiled effort all around and soon after, Madrid would find another, this time due to Kroos himself as Nacho played assister in the box. 4-1 and it was all over. Madrid still have a few more finals on the horizon, with the first being the mid week battle away to Celta Vigo. For now, things look good and Madrid should be confident going into the last match. Attackers: Asensio, Cristiano Ronaldo, Morata. Cristiano Ronaldo next game is a La Liga fixture on May 17 of 2017 against Celta de Vigo. You can watch Juventus live stream, Celta de Vigo vs Real Madrid, Liverpool vs Middlesbrough, Chelsea vs Watford, Arsenal vs Sunderland, and Reading vs Fulham, all matches provided from our live sports game pages.